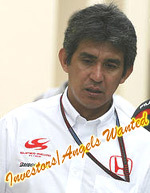 Aguri Suzuki the founder of the Super Aguri Formula One Team is searching for investors to help the team move forward, or possibly even to help the team survive. Formula One these days is a costly business, and without large sums of money coming in teams just cannot survive as we have seen so many times over the years. Apparently the team is in talks with Alejandro Agag, from Spain, who recently bought a majority stake in the GP2 team Campos Grand Prix. Maybe we will start to see mergers and buyouts in Formula One like we have seen in NASCAR lately, although with the Formula One grid set at twelve two car teams, a Formula One Franchise is a lot more desirable than a guaranteed top 35 spot NASCAR team.